Summer is waning; fall will soon arrive with hints of yellow and red leaves beginning to show. I sure do miss the cornicopia of fall colors as the season begins to change. My lone maple tree gives me a hint of those fall colors of Ohio I miss so much. Soon I hope to venture to the Buckeye State to visit my siblings and cousins. Hope some of the leaves will be still be turning brightly when I get there. Nature can be a beautiful experience if you only take the time to enjoy it. This young Brown Pelican was wandering the beach and saw a small yellow budding bloom. It stopped to smell the flowers. What a moment to capture. What a lesson for us all. When is the last time you stopped to smell the flowers, got up early to see the sunrise, or watched the full moon set behind the trees? Take a moment this week to stop and smell the flowers. If you haven’t met God lately you will when you look at his creation. “ For since the creation of the world God’s invisible qualities—his eternal power and divine nature—have been clearly seen, being understood from what has been made, so that people are without excuse.” (Romans 1:20 NIV) Blessings. Stop and smell the flowers! 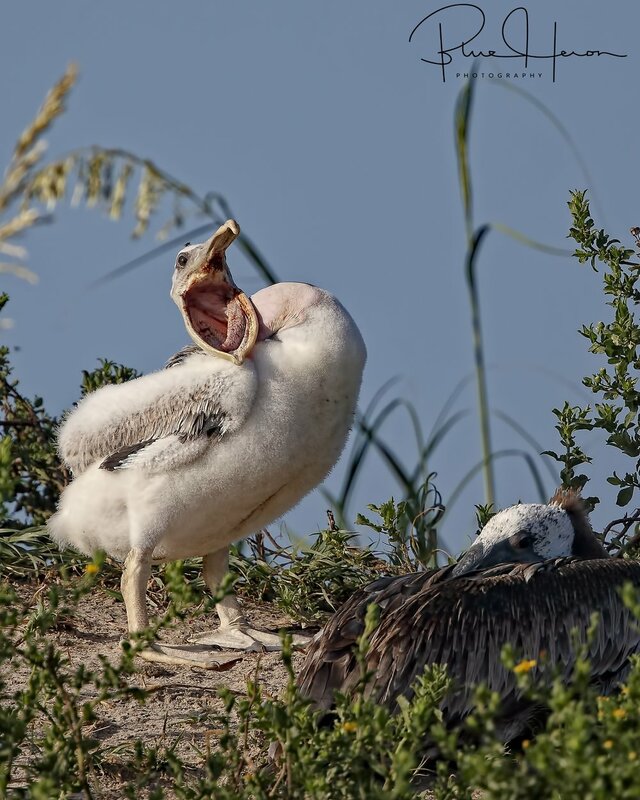 This Brown Pelican chick did, so can you! I like dead flowers!....doesn't my smile remind you of the Mona Lisa? Who has time to smell flowers? Gotta get to work..! Gotta fly...no time for flowers! Watch the moonrise if you don't want to smell the flowers! The sun rises over the old dead bones of past generations of trees lying on the beach. The "Dog Days" of summer are officially over. Tell that to the weatherman. Anxious for the cool breezes of fall and the changing season, life goes on amidst the waning days of the summer beach life in Florida. And “go on” is the key. A new generation of Royal Terns, Laughing Gulls, Brown Pelicans and Sandwich Terns will be the wing-bearers of the next generation. From fragile eggs, to hatchlings, to fuzzy down covered chicks, and now to fledgling young birds, it is time for the new generation to take wing. There are fewer numbers each week in the dunes and on the beach. But that is a good thing. The parents have done their duty. Fierce instincts prevail with each generation to produce young for survival of the species. Feeding and protection is a never-ending task. Nearly half of the chicks that survive to fledge will probably not make it to next year. Those that do however, will be the young immature birds who follow their parents, learn the best fishing and feeding times, techniques, places, and then return to these dunes for another season. Soon the fall migrations will start. But that is another story for another day. The good news for the tireless parents is there will be no college tuition to save for, no braces to pay for and no need to go haul the young to the next soccer game or gym practice. They have their own wings now! When those times of life come that seem overwhelmingly stressful, when our worries mount, and our inner resources seem depleted, just: "Consider the birds of the air. They neither sow, nor reap, nor gather into barns, and yet your heavenly Father feeds them. Are you not much greater value than they are?" (Matt 6:26) Blessings. Old tree bones greet the morning sun on Blackrock Beach.. The "three amigos" celebrate the fledging of their young charge with a fish.. This juvenile Laughing Gull has fully fledged and eating on its own now.. The Royal Terns are protecting this young fledgling waiting to be fed still. Brown Pelican chicks are starting to feather and growing fast. One week later these siblings are starting to sport tail feathers..
Do these feathers make my tail too fat? Gaspar the friendly Ghost Crab..
A Ruddy Turnstone Male scans the beach sand for tidbits..they "turn over stones" looking for what is underneath, thus the name..
Dog days are gone, summer is flying by like this Great Blue Heron.. The "Dog Days" of summer officially came to an end this past week, but few people know what the expression really means. The phrase actually has a celestial origin. Some will say that summer's "Dog Days" signify hot sultry days "not fit for a dog," while others suggest it is the weather in which dogs go mad. The “Dog Days” are based in astronomy. The Old Farmer’s Almanac lists the traditional timing of the Dog Days: the 40 days beginning July 3 and ending August 11, coinciding with the heliacal (at sunrise) rising of the Dog Star, Sirius. Regardless of what you believe, this Florida resident is ready for cooler weather. In the meantime, the Brown Pelican colony baby hatching is in full swing. I can’t believe how much they have grown in just two weeks. The chicks have gone from bald pink/brown to fuzzy white little pelican babies. 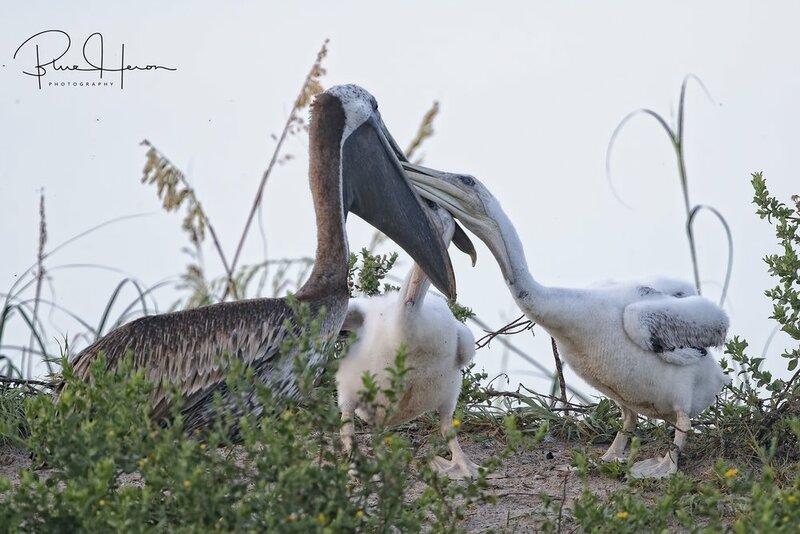 Several of the nests have two chicks (baby pelicans are indeed called chicks). The chick I named “Bradford” is really getting big. Brown Pelicans usually nest in mangrove islet swamps and trees and rarely do they nest on sand dunes like we have seen. I assume the lack of secure mangrove swamps made them want to nest in these dunes. There is ample vegetation and cactus to provide protection. 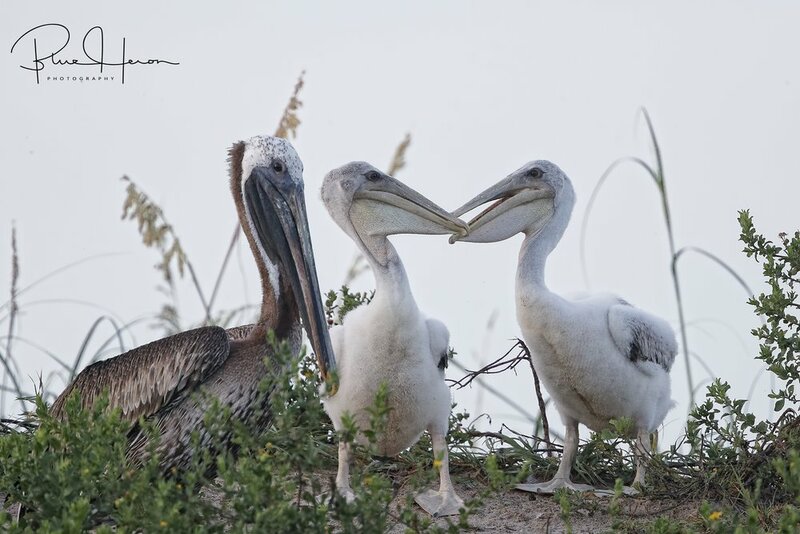 The male Brown Pelican choses the nest site and the female builds the nest of sticks and shrub. They incubate the eggs with their feet. From the time the chicks hatch to fledging can be 77-84 days. Brown Pelicans fish from a diving position. Per the Cornell Laboratory of Ornithology “A foraging pelican spots a fish from the air and dives head-first from as high as 65 feet over the ocean, tucking and twisting to the left to protect its trachea and esophagus from the impact. As it plunges into the water, its throat pouch expands to trap the fish, filling with up to 2.6 gallons of water. “The oldest recorded Brown Pelican was 43 years old. Pelicans are mentioned five times in the bible. These young pelican chicks have a full life ahead of them hopefully. Hope you enjoy the beauty of this small bit of bird creation. Blessings. 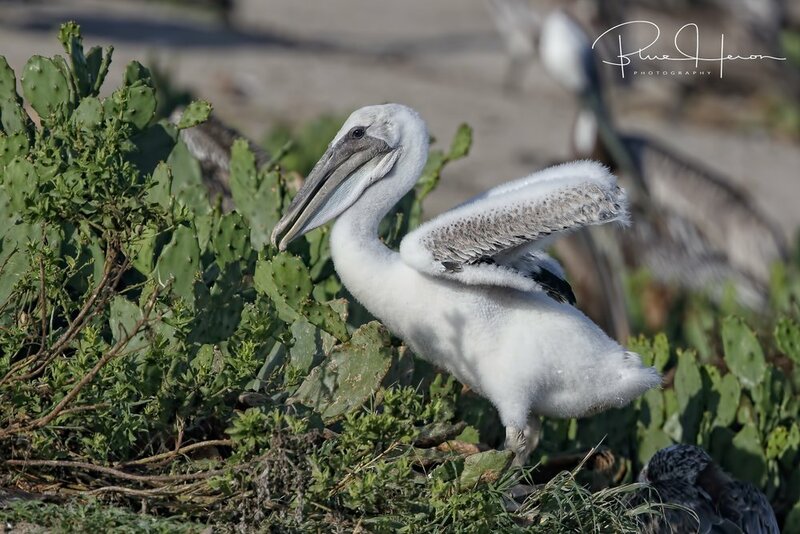 A wonderful bird is the Pelican...Brown Pelican returns to the nest site..they are losing the breeding plumage. This was a hatchling chick two weeks ago..bald as a billiard ball..
Save some for me there bro! I could eat a whale! Say ahh!...fill it up Mom! In a few months I will be flying with these wings! Last week the Editor and I took a wonderful trip on the train via Amtrak to Boston. What a great way to travel and see the east coast without the hassle of long days of driving and hotels and such. It was so relaxing just watching the world go by in comfort. We learned some dos and don’ts (took too many bags of luggage, etc.etc.) Overall it was worth it and enjoyable. Met up with some good friends in Maine, saw some Puffins and lots of foggy days. On our return we stopped by just north of Boston for a wonderful ocean view dinner with my ole (not too old) Academy roommate John and his lovely wife Irene. We made our train connection home via Washington DC with 2 minutes to spare. On my previous visit to the same Puffin adventure last July I had clear blue skies and calm seas. I wanted the Editor to see the same blue skies and calm seas but we awoke on the morning of my first Puffin excursion to pea-soup fog. It stayed that way until the day we left. We still did enjoy sitting on the balcony deck at the Riverside Inn with our friends Ed and Deb and watched a pair of local Eagles and Canada Goose fly up and down the river. 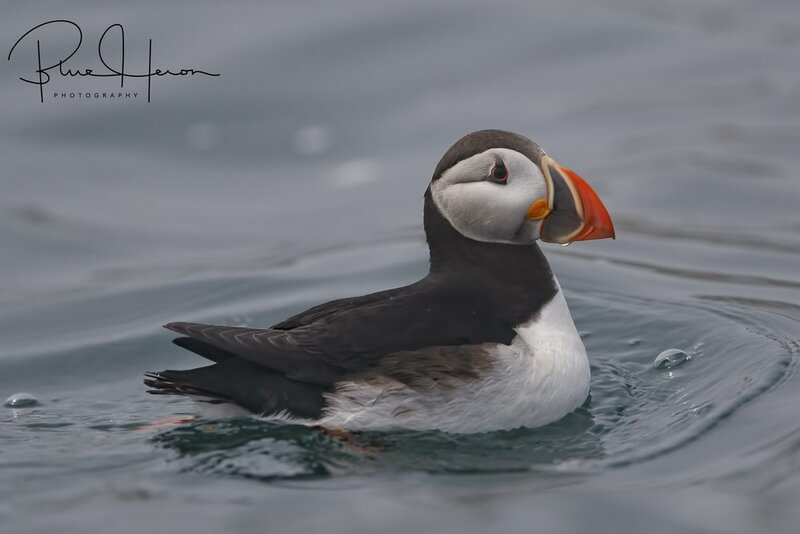 The seas were too rough to safely land on the island, so our photography of the Puffins was limited to whatever birds we could find floating nearby. The captain put us in the small launch and we did get some sea-level shots when the fog briefly lifted. The second day the seas precluded safe boating, so we remained in the main tour boat. In the afternoons we toured the local country side and feasted on lobster and blueberries. The Editor got to see the Lupines up close and brought some seeds home. I didn’t get my dream Puffin shot but did make one capture worthy of a National Geographic cover shot. Hope you enjoy these photos of the Maine event. Next year we are thinking of going a bit further North to Newfoundland Canada to see the Puffins. Blessings. 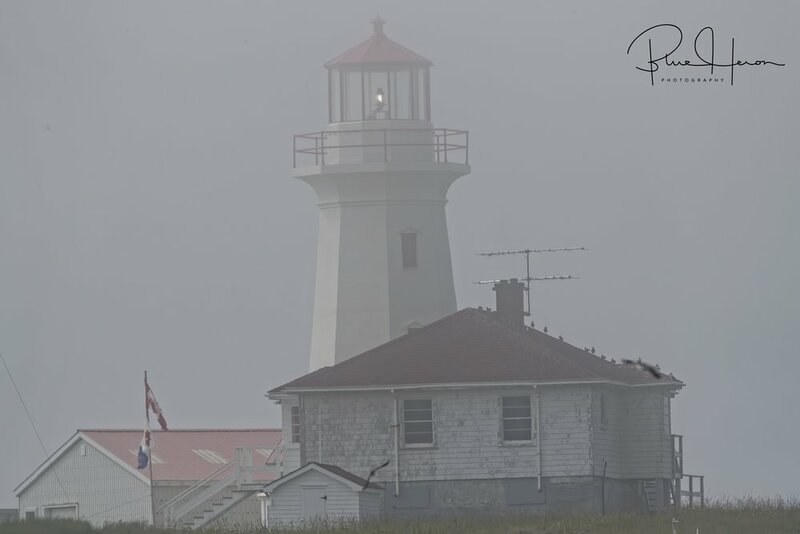 Machias Seal Island lighthouse barely visible in the fog...a lot different than last years view. This was how we captured our photos the first day..very challenging conditions indeed. Puffins need to take a running start to lift off due to their short stubby wings..
Once airborne they need to really beat those wings to stay up. Whee.....I'm free from the sea! A very "Penguin looking" Razorbill floats by the boat.. 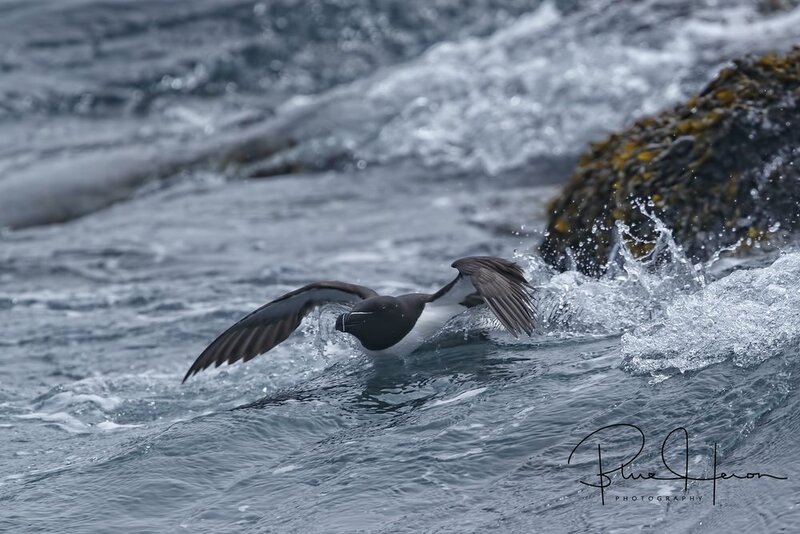 The deep diving Common Murre was also on the island in large numbers. Juvenile Herring Gull fly by..
My National Geographic worthy Cover Photo of a Puffin walking on water...(actually this cover shot photo can by made with any photo via Nat Geo's "Create your own cover" but maybe someday I will make the real thing). Had a wonderful dinner with Academy roommate John Kucinski and beautiful wife Irene..this it their vacation home north of Boston ocean view!